Maruti Suzuki has achieved a sales milestone of selling ten lakh Wagon R small cars and has launched a Wagon R Millenium Limited edition model to celebrate the same. 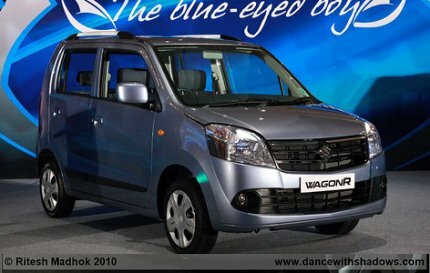 Eleven years of the Wagon R’s existence have whizzed past us in what seems like the blink of an eye, so how has the box shaped Wagon R come to become the present day ‘Blue Eyed Boy’, let’s take a quick look. Maruti Suzuki first introduced the Wagon R in the Indian market in December 2000 and what most of us seem to have forgotten is that the R in ‘Wagon R’ stands for ‘Recreation’. Back then Maruti Suzuki had claimed that the car aims to combine the practicality of a van with the drivability of a car. Maruti Suzuki gave makeovers to the Wagon R in 2002, 2004 and 2006. All of these were mostly cosmetic upgrades such as redesigned bumpers, reworked headlamps and tail lamps etc. In 2010, Maruti Suzuki launched the all-new Wagon R built on a fresh platform that had grown up not just in dimensions, but also improved substantially in many departments such as ride quality, handling and premium interiors. The Wagon R’s large front fascia comprises a long hood, prominent nose grille, blue tint on the top edge of the headlamps, large air dam and a bold Suzuki logo. Overall, the car is less boxy than its predecessors, appealing larger audience. This is evident from the fact that sales of Wagon R has been consistently above 14,000 units in the past several months. On the inside, the new Wagon R gets some of the tidy elements which the special edition model will also carry forward. The steering and gear knob of the Swift have now been carried over to the Wagon R.
The new Wagon R has more headroom, legroom and shoulder room when compared to its only direct rival, the Hyundai Santro. However, the car has its limitations such as a small 180 litre boot, forced vertical movement while cornering and when driving in strong cross winds. Also read: I’m a Wagon R owner: What should be my next car? The new Wagon R is powered by the 1-litre K-Series engine that produces 67 bhp of maximum power at 6,200 rpm and 90 Nm of torque at 3,500 rpm, the limited edition model too will sport the same engine. This petrol motor is refined and works well when driven in city traffic. Maruti has improved the gear box and clutch action making the Wagon R an urban and practical car. However, out on the highway, the car’s skinny tyres and tall height make it uninspiring. Maruti Wagon R is available in 4 variants: Lx, Lxi (Lxi Duo – LPG), Lxi CNG and Vxi, with prices ranging from Rs. 3.37 lakh to Rs. 4.22 lakh. All prices are ex-showroom, Delhi. We expect the special edition model to push the sales of the Wagon R a little higher as this is more than just a minor face lift and customers may appreciate the added features.